The leatherback sea turtle is the largest of all the living turtles and the fourth largest living reptile after certain crocodiles and alligators. The enormous leatherback sea turtle has an average length of 1-2 metres (6-12 ft) and weighs 250-700kg (550-1500 lb). An adult leatherback sea turtle is longer than an average size man. The largest ever found was over 3 metres (18 feet) from head to tail and weighed 916 kilograms (2019 lb). It was found on a beach on the west coast of Wales. This gigantic turtle is called a leatherback sea turtle because its shell is like a thick leathery skin. It feels like hard rubber. This leathery skin makes the leatherback sea turtle different from other sea turtles, which have bony shells. It has seven distinct ridges on the top domed part of its shell. The ridges cross from the front to the back of the turtles’ neck. These ridges and the large teardrop shaped body help the turtles to glide smoothly through the water. The turtle’s back is dark grey to black with lots of white spots on it. Leatherback turtles are the deepest diving marine animals. They can dive to about 1.28 kilometres (0.8 miles) under the surface. On top of that, they can stay under the water for quite a while. It shows that they do have a strong lungs! They are also the fastest moving reptiles. They can swim at about 35 kilometres per hour (22 miles per hour) in the water. The leatherback sea turtle is equally happy in cold or warm water. You can find them as far north as Norway and south off the coasts of Chile and New Zealand. Therefore the leatherbacks are are spread more widely over the earth than any other reptiles species. They can be found in all tropical and subtropical oceans, even in the icy cold seas of the Arctic. They have a unique body which enables them to live in the cold ocean. They are able to maintain a high body temperature in cold water because they are big, they have a thick layer of fat just under the skin, they get a lot of heat from their muscles when they swim and they can cut off the blood flow from their cold flippers. All other sea turtles are confined to the warmer regions of the world’s ocean. Adult leatherback turtles have have been found with a body temperature of 18C (20F) above the surrounding water. Leatherback turtles have a large pair of front flippers. These front flippers are flat which help the leatherbacks to swim in the open sea. There are no claws or scales on the front flippers, which are much longer than other sea turtles’ flippers. The back flippers of the leatherbacks have a paddle-shape. Letherbacks’ front flippers can grow to about 2.7 meters (3 yards) in larger leatherbacks. With its ridged shell and huge flippers, the leatherback sea turtle can travel huge distances. They travel an average 6000 kilometres (3700 miles) each way between the place they lay their eggs and their feeding areas. Mother leatherbacks lay about 100- 150 eggs on tropical beaches. They lay their eggs several times during a nesting season. After about 2 months leatherback hatchlings, with white stripes along the ridges of their backs and on the flippers, dig their way up to the surface of the sand. Leatherback hatchlings are about 50-77 centimetres (20-30 inches) long. They have front flippers which are as long as their bodies. They weigh about 40-50 grams (1.4-1.7 oz). 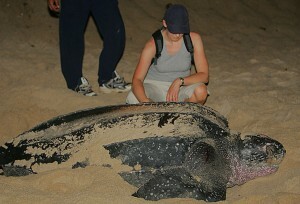 A mother leatherback will return to lay her eggs on the same beach where she hatched. What Do Leatherback Sea Turtles Eat? Leatherback sea turtles’ main diet is jellyfish. They also add fish, squid and other sea creatures with no bones to their diet. Pacific leatherbacks swim as far as across the Pacific Ocean from Indonesia to California to eat the jellyfish there. What a great marathon swimmer they are! One cause for the decline in the numbers of leatherbacks is floating plastic bags in the ocean. These Pacific leatherbacks mistake these plastic bags for jellyfish and try to eat them. As a result of that one third of adult leatherbacks have eaten a plastic bag. So, we really should stop using the plastic bags and began to make it a habit to use reusable shopping bags. Even a small amount of plastic can kill a leatherback by blocking its digestive system. Apart from plastic bags, they also face many other threats. People in some countries love to eat the leatherbacks’ eggs. So many turtle’s eggs have been dug up in Asian countries that the number of leatherback turtles has plummeted. For example, Rantau Abang beach in Terengganu, Malaysia was once the largest nesting ground in the world. It had 10,000 leatherback turtle nests each year. However in 2008, only 2 miserable nests were found at Rantau Abang – and to make matters worse the eggs were infertile, with no chance of hatching baby turtles. The major cause for the decline is that the eggs were aggressively collected for food to be sold in the market. It’s not just humans who love to eat the leatherback turtles’ eggs or hatchlings – the baby leatherback sea turtle has many predators. Seabirds and raccoons love them as well. So, before hatchlings can reach the sea many of them will be eaten by these predators. Those that manage to enter into the water will be eaten by sharks and large fishes. Only 1% survive to adulthood. In Indonesia, you can find shops which sell all kinds of turtle souvenirs like turtle-skin bags, jewellery made from turtle’s shells and stuffed turtles. In Europe there is a growing demand for sea turtles because more and more people are starting to like turtle soup. The beaches which are used by the leatherbacks to lay their eggs have been used to build hotels and restaurants. As a result of these activities, many leatherbacks have lost their natural habitat, mother leatherbacks are afraid to lay their eggs at the beach and the eggs are crushed by people while sun bathing, playing and driving on the beaches. Many leatherbacks fall victim to huge fishing lines like the driftnets. If the sea turtles are caught in the net and unable to surface to breathe, they can drown. Leatherbacks travel far and wide in the ocean, they come in contact with people around the world. Therefore, efforts to help the leatherbacks in one country may be ruined by activities in another country. For example, protecting leatherback turtles on U.S. nesting beaches and in the U.S.waters alone is not enough to ensure the safety and population of the leatherbacks. The bad news is although lots of effort have been put in to save these beautiful marine creatures, they are still heavily exploited by people especially in the black market at the nesting beaches. I agree… great information. Easy to read. Thanks! cool website really like it! Can really dive deeper than a sperm whale? The picture does not match a baby leatherback sea turtle. They are black and have white dotted lines along the shell. 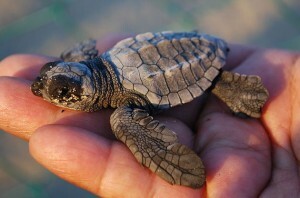 The photo of the hatchling in NOT a Leatherback. It’s more likely to be a Ridley Sea Turtle hatchling. If you even read your own article you would have know it wasn’t a Leatherback, as the last paragraph in the section “Leatherback Habitat” states that the hatchlings have white stripes on theit flippers and along the ridges on their backs. Even someone who knows next nothing about Leatherbacks could tell you that the shell on the hachling in the photograph instantly disproves your caption. Hi, thanks for the comments. We’re having some technical issues that make it hard to edit the pages right now, but when those are fixed, we’ll update the photo. Thanks!